The Boeing 767 is a mid-size wide-body twin-engine airliner produced by Boeing Commercial Airplanes. Versions of the 767 can carry between 181 and 375 passengers. The first wide-body twinjet produced by Boeing, the 767 was conceived and designed in tandem with the narrow-body Boeing 757 twinjet. Both airliners share design features and flight decks, enabling pilots to obtain a common type rating to operate the two aircraft. The 767 was the first Boeing wide-body airliner to enter service with a two-person crew flight deck, eliminating the need for a flight engineer. Following in-service indications of its twinjet design reliability, the 767 received regulatory approval allowing extended transoceanic operations beginning in 1985. Boeing 767 models have a range of 5,200 to 6,590 nautical miles (9,400 to 12,200 km) depending on variant and seating. The 767 has been produced in three fuselage lengths. The original 767-200 first entered into airline service in 1982, followed by the 767-300 in 1986, and the 767-400ER in 2000. Extended range versions of the -200 and -300 models, the 767-200ER and 767-300ER, have been produced with added payload and operating distance capability. The 767-300F, a production freighter version, entered service in 1995. Through the 1990s, the Boeing 767 became commonly operated on medium- to long-haul routes, and the aircraft has ranked as the most widely used airliner for transatlantic flights between the United States and Europe. The aircraft is regarded as an ETOPS pioneer, being the first to receive 180-minute approval by the FAA. There have been over 1,000 Boeing 767s ordered with over 990 delivered as of 2010. The -300/-300ER models are the most popular variants, accounting for approximately two-thirds of all 767s ordered. There were 863 Boeing 767s in service with over 40 airlines as of July 2010. In 1972, following the introduction of the first generation Boeing 747, Douglas DC-10, and the Lockheed L-1011 TriStar wide-body airliners into passenger service, Boeing embarked on parallel development studies for two new airliners. Code-named 7X7 and 7N7, these studies aimed to take advantage of new materials and propulsion advances in the civil aerospace industry. The 7N7, which developed into the Boeing 757, was conceived as a narrow-body twinjet replacement for the Boeing 727. The 7X7 was intended to be a mid-size wide-body airliner slotted between the Boeing 707 and Douglas DC-10. With aging fleets of 707s needing replacement, the 7X7 would slot between the Boeing's narrow-body jetliners and the 747. Initially, the 7X7 studies focused on a trijet design, with possible configurations including overwing engines, a T-tail, among others. In 1976, a twinjet wide-body layout, similar to the earlier Airbus A300B, became the preferred configuration, reflecting increased industry confidence in the reliability and economics of new generation turbofan engines. Airlines remained ambiguous in their requirements for the aircraft, which was roughly focused on the medium-haul, high-density market. High-density routes in the U.S. domestic market, a role targeted for the 7X7, involved the transport of large numbers of passengers between major cities. 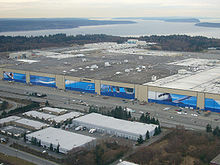 Picture - Boeing's Everett Factory, site of 767 manufacture along with the 747, 777, and 787. On January 5, 1978, Boeing announced a major extension of its Everett production site, then dedicated to 747 manufacture, to accommodate its new mid-size wide-body family. That year, Boeing formally designated its new wide-body airliner as the 767, and the company planned to offer three variants: a 767-100 with 180 seats, a larger 767-200 with 210 seats, and a trijet 767MR/LR version with 200 seats intended for intercontinental routes. The 767MR/LR was eventually dropped in favor of standardizing around the twinjet configuration, and the 767-100 was ultimately not offered for sale, as its capacity was too close to the 757's. On July 14, 1978, the Boeing 767 was officially launched by United Airlines, which placed an order for 30 767-200s, followed later that year with orders from American Airlines and Delta Air Lines. The Boeing 767 design phase occurred at the same time as the 757, its narrow-body sibling. Development occurred in partnership with Italy's Aeritalia along with a consortium of Japanese aerospace companies. Both the 757 and 767 became the first Boeing jetliners to share common flight decks and handling characteristics. The aircraft was also the first Boeing jetliner after the 737 to be designed with a two-crew cockpit. The 767 was intended to be operated with a two-person flight crew, with electronics to assist with the monitoring of systems. As a result of their shared flight deck design, after a short conversion course, pilots rated in the 757 would also be qualified to fly the 767 and vice versa. Both twinjets were further designed with similarly configured systems, shared instrumentation, avionics, and flight management systems. For the 767 design, Boeing incorporated the engines that were available then on the 747, namely the Pratt & Whitney JT9D and General Electric CF6, with wings sized to match. The 767 was the first Boeing jetliner to offer a choice of engines at its launch. The wings were large relative to fuselage size and provided higher-altitude cruise performance, along with capacity for possible stretched variants. Moreover, the larger wings increased fuel usage slightly and provided better takeoff and landing performance. The 767 wings had increased thickness for added fuel capacity, and their aft-loaded design produced the best spanwise distribution of lift on a Boeing jetliner to date. The basic 767 was designed with enough range to fly across North America or across the northern Atlantic. The 767's fuselage width was set at 15 feet 6 inches (4.72 m), midway between Boeing narrow-bodies and the 747. It was narrower than previous wide-body designs but produced less drag, thus increasing overall range. Seating capacity was set at a seven-abreast cross-section, enabling Boeing to taper the rear fuselage over a shorter length, and allowing parallel aisles for the entire length of the passenger cabin. However, the fuselage width did not accommodate typical wide-body cargo hold units, necessitating a smaller container design. Construction of the prototype Boeing 767, a -200 variant, began on July 6, 1979. Despite Boeing's two-person digital cockpit design, United Airlines initially demanded a conventional three-person crew with two pilots and a flight engineer. United's position was due to concerns about the risks associated with introducing a new aircraft. Boeing tried to convince United and others to adopt its new cockpit design with data from the two-person crew Boeing 737. In 1981, a U.S. Presidential task force studied the safety of operations with two crew on wide-body aircraft, and compared its capabilities to three-person configurations. The task force determined that a crew of two was safe for flight in July 1981, which paved the way for acceptance of the 767's two-person flight deck. One airline, Ansett Australia, ordered 767-200s with a three-person flight deck, due to union demands. These were the only 767s fitted as such. The first 767, registered N767BA and equipped with Pratt & Whitney JT9D turbofans, rolled out on August 4, 1981. The aircraft took its maiden flight on September 26, 1981. Enlisted for the 767 flight test program, the first four aircraft built were equipped with JT9D engines, while the fifth and sixth aircraft were fitted with General Electric CF6-80A turbofans. The sixth airframe was used in route-proving flights. Following the successful completion of flight testing, the JT9D-powered 767-200 received Federal Aviation Administration (FAA) certification on July 30, 1982. The first 767 with a two-person flight deck completed its maiden flight on May 27, 1982. The CF6-80A-powered 767-200 was certified by the FAA on September 30, 1982. Picture - A 767-300ER of Air Canada, one of the earliest transatlantic operators of the 767. Following the first delivery to United Airlines in August 1982, the 767-200 entered airliner service on September 8, 1982, with its first flight from Chicago to Denver. Delta Air Lines commenced service with the CF6-powered 767-200 on December 15 of the same year. Deliveries to mainline U.S. carriers American and TWA followed. The 767's service introduction was relatively smooth, with few technical issues, and greater operational reliability than prior aircraft. 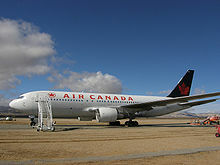 The 767 received early international orders from Air Canada, All Nippon Airways, Ansett Australia, Britannia Airways, Egyptair, El Al, Ethiopian Airlines, and Transbrasil. The 767 was approved for U.S. CAT IIIb instrument landing operation in March 1984. This revision permitted operations with minimums as low as RVR 300 (Runway Visual Range 300 meters). The 767 was the first aircraft certificated for CAT IIIb by the FAA. A key issue in early Boeing 767 operations was proving the aircraft's reliability for overseas operations. Prior to the 767, the FAA restricted twin-engine aircraft to over-water flights of 90 minutes or less distance from diversion airports. In June 1985, the FAA granted approval for 120-minute Extended-range Twin-engine Operational Performance Standards (ETOPS) to 767 operators, on an individual airline basis, provided the operator met flight safety standards. The increased safety margin changes were permitted due to the improved reliability demonstrated by the 767's turbofan engines. The FAA lengthened the ETOPS time to 180 minutes for GE-powered 767s in 1989, making the twinjet the first aircraft to be certified under the longer duration. Approvals for the other 767 engines were obtained by 1993. ETOPS allowed for much expansion of transatlantic flights by twin-engine airliners. Picture - A Delta Air Lines 767-400ER. The type was the first Boeing wide-body jet resulting from two fuselage stretches. Boeing developed the higher gross weight 767-200ER (Extended Range) variant, the lengthened 767-300, and the longer range 767-300ER in the 1980s. In the late 1980s, Boeing proposed a stretched version of the 767 and then a partial double-deck version with parts of a 757 fuselage built over the rear fuselage. These concepts were not accepted, and Boeing shifted to an all-new airliner that later became the 777. Boeing developed a freighter model, the 767-300F, in the mid-1990s, and another stretched passenger version, the 767-400ER, in the late 1990s. The 767 sold very well from the late 1980s to the late 1990s, with a decrease during the recession of the early 1990s. During this time it became very popular as the most common airliner used for transatlantic operations between North America and Europe. After strong sales in 1997, sales have declined significantly because of the economic recession of the early 2000s, increased competition from Airbus, and the recent emergence of a direct replacement program, the 787. In early 2007, orders were placed by UPS Airlines for 27 767-300Fs and DHL for 6 767-300Fs to extend production. Boeing had received 24 net orders for the 767 in 2008, but only 7 in 2009 and 3 in 2010. The company began offering the 767-300ER to tide customers affected by 787 launch delays, specifically to Japanese carriers All Nippon Airways and Japan Air Lines. The renewed interest in the 767-300F has Boeing considering enhanced versions of the 767-200 and 767-300F, with increased gross weights, 767-400ER wing technology, and 777-200 avionics. Boeing sees the advanced 767-200F and 767-300F proposals as complementing the 777F, and allowing Boeing to compete more effectively against the Airbus A330-200F, which is larger than the proposed 767-200F and 767-300F, but smaller than the 777F. 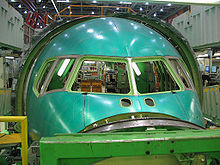 The Boeing 767 has 1,044 orders, with 995 of those delivered as of January 2011. Delta Air Lines is the world's largest 767 operator, with 101 airplanes as of 2010, consisting of 767-300, 767-300ER, and 767-400ER variants. On February 2, 2011 Boeing rolled out the 1,000th 767 for All Nippon Airways. This was also the last 767 produced on the old 767 production line. All future 767s will be produced on a new smaller production line. The 767 is the second wide-body aircraft to reach the 1,000-unit milestone after the 747. Targeted at the emerging mid-size wide-body aircraft market, the Boeing 767 incorporated technological advances in avionics, engines, and wing design. At its introduction, new technologies included Rockwell Collins cathode-ray tube (CRT) displays, replacing conventional electromechanical instruments, and an enhanced flight management system, improved over versions used on existing 747 models. The 767's passenger and service doors are an overhead plug type, which retract upwards, and commonly-used doors can be equipped with an electric-assist system. As the 767's fuselage width allows for only one row of standard Unit Load Device containers to be carried, a different container class, the LD2 (or LD-2), is specified for 767 cargo holds where it can be carried side-by-side. Picture - Planform view of a British Airways 767-300 after take off, with retracted landing gear and partially deployed flaps. The Boeing 767 is a low-wing cantilever monoplane with a conventional tail unit with a single fin and rudder. The wings are swept at 31.5�, slightly more than the 757, and optimized for a cruising speed of Mach 0.8. Power is provided by two wing-mounted high-bypass turbofan engines. The 767 has a retractable tricycle landing gear with four wheels on each main gear and two for the nose gear. The wing and gear design of the -200 accommodated the later stretched -300 configuration without major changes. For the 767-400ER, the same general landing gear configuration was used, but with a larger main gear in a more widely spaced configuration using 777 wheels, tires, and brakes; a retractable tail skid was also added. The original 767 cockpit design, shared with the 757, uses six Rockwell Collins CRT screens to display electronic flight instrumentation. The displays are used for electronic flight instrumentation system (EFIS) and Engine Indication and Crew Alerting System (EICAS) information, taking over the former role of the flight engineer. From its introduction, the 767 was equipped with an automatic landing system for low-visibility conditions. 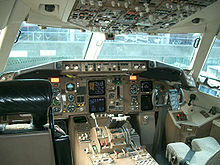 Shared cockpit design and design commonality with the 757 allows pilots to obtain a common type rating to operate both aircraft, with 767 and 757 pilots able to share the same seniority roster. For the 767-400ER, the cockpit layout was simplified further with five Rockwell Collins liquid crystal display (LCD) screens, and adapted for similarities with the 777 and the 737 Next Generation. The 767 features a twin-aisle cabin with a typical configuration of 2-3-2 in economy class and 2-2-2 in business class. In the 2-3-2 layout, every passenger is no more than one seat from the aisle, allowing for faster entry/exit and meal service. This seven-abreast layout also places 87% of all seats at a window or aisle, accommodating passenger requests, and the seat-to-aisle ratio of 3.5 seats is less than other jetliners' four to six economy seats per aisle. On the 767 it is possible to squeeze an extra seat for a 2-4-2 configuration, however this seating is cramped and therefore uncommon. At its debut, the 767 cabin incorporated new design features intended to enhance on-board convenience. The overhead bins were larger than on previous aircraft, sized to accommodate garment bags without folding, and strengthened for heavier carry-on items. More lavatories per passenger were offered than previous models, including in the center cabin, in consideration of an estimated four hour average flight time for early 767s. A single large economy galley was installed near the aft doors on both the 767 and 757, allowing for faster meal service and ground loading. Newer 767-200s and 767-300s, as well as all 767-400ERs, feature a 777-style cabin interior, known as the Boeing Signature Interior. Launched on the 767-400ER, this interior features even larger overhead bins, indirect lighting, and sculpted panels. The 767-400ER also is equipped with larger windows exactly like those found on the 777. All new 767s built feature the Signature Interior, and it is available as a retrofit for older 767s. In addition to the Signature Interior retrofit option, a simpler modification known as the Boeing 767 Enhanced Interior is available. This retrofit borrows styling elements from the Boeing Signature Interior, with curved ceiling panels and indirect lighting, but only minimally modifies existing overhead bins and cabin architecture. There are three basic variants of the 767, differing in fuselage length, which were launched on three separate occasions. The 767-200 was the original variant launched in 1978, followed by the 767-300 in 1982, and the 767-400ER in 1997. Extended-range models, the 767-200ER and 767-300ER, were launched in 1982 and 1984, respectively. Freighter versions of the -200 and -300 variants have also been developed. The first model of the Boeing 767 family, the 767-200, was launched in 1978 and entered service with United Airlines in 1982. Initial customers also included Delta Air Lines and American Airlines, with the model used primarily by mainline U.S. carriers for domestic continental routes between major hub centers, including flights from New York City to Los Angeles. The 767-200 typically is outfitted with 181 seats in a 3-class layout or 224 in a 2-class layout. All standard -200 models have a capacity limit of 255 due to exit-door limitations. An additional exit door could be specified when the aircraft was ordered to allow for up to 290 seats in a high-capacity, all-economy 2-4-2 layout. Some 767-200s were later converted to the -200ER specification. Boeing proposed a conversion of -200s into Special Freighters in 1998 to replace aging DC-8 freighters and conversion work began later that year. Israel Aerospace Industries holds a supplemental type certificate for conversion of 767-200s to -200SFs since 2005. Deliveries for the -200 have totaled 128 aircraft with no unfilled orders remaining. A total of 156 767-200/-200ER/-200SF aircraft were in airline service as of July 2010. Its main competition was the Airbus A300 and A310. The extended-range variant of the original Boeing 767, the 767-200ER, was first delivered to El Al in 1984. The 767-200ER became popular overseas with smaller operators seeking wide-body airliners but not needing the 747's capacity. This model became the first 767 to complete a nonstop transatlantic journey, and broke the flying distance record for a twinjet airliner on April 17, 1988, with an Air Mauritius 767-200ER flying 8,727 nautical miles (16,162 km) between Halifax, Nova Scotia and Port Louis, Mauritius. Deliveries of the -200ER have totaled 121 with no unfilled orders. Although the 767-200ER has no direct replacement, it is expected to be succeeded in Boeing's lineup by the 787-8. 767s flown by American Airlines burn an average of 15,982 US gallons (60,500 L) of jet fuel flying round-trip between New York City and Los Angeles; the 787 is expected to be 20% more fuel efficient per passenger. The 767-300 is a 21.1 ft (6.43 m) stretch of the 767-200, with an overall length of 180 ft 3 in (54.94 m). The -300 was first ordered by Japan Airlines in 1983. It first flew on January 30, 1986, and was delivered to JAL later that year on September 25. The 767-300's direct competitor from Airbus is the A330-200. The 767-300 is expected to be replaced by the 787-8 in Boeing's lineup. Deliveries for the 767-300 total 104 with no unfilled orders. A total of 670 Boeing 767-300/-300ER/-300F aircraft were in airline service as of July 2010, accounting for approximately two-thirds of all 767s built. The 767-300ER is the extended-range version of the -300. It first flew in 1986 and received its first commercial orders when American Airlines purchased several in 1987. The aircraft entered service with AA in 1988. In 1995, EVA Air used a 767-300ER to inaugurate the first transpacific 767 service. The -300ER is the most popular variant of the 767 in airline service. Total deliveries for the 767-300ER stand at 545 with 24 remaining unfilled orders as of January 2011. The 767-300ER can be retrofitted with blended winglets from Aviation Partners Boeing. These winglets are 11 ft (3.4 m) long and decrease fuel consumption an estimated 6.5% on the -300ER. American Airlines was the first airline to retrofit the 767 with blended winglets. All Nippon Airways and Delta Air Lines have also ordered winglet kits. The 767-300F is the air freight version of the 767-300ER, first ordered by UPS Airlines in 1993 and first flown on June 20, 1995. Following a flight test program, deliveries began in October 1995. The 767-300F can hold up to 24 standard 88 by 125 in (2,200 by 3,200 mm) pallets or containers on its main deck and any combination of up seven 88 by 125 in (2,200 by 3,200 mm) or 96 by 125 in (2,400 by 3,200 mm) pallets or containers. This model has two doors on the main deck plus three on the lower deck. The two upper doors comprise of one for the crew and one for the cargo. Of the three doors on the bottom, two are on the right side, and one is at the rear left side. Deliveries for the 767-300F total 59 with 25 unfilled orders as of January 2011. In October 2007, All Nippon Airways sent one of its Boeing 767-300s to ST Aviation Services Co., in Paya Lebar, Singapore, to undergo the first 767 PTF (Passenger To Freighter) program. The conversion was completed in June 2008 and the aircraft was re-designated Boeing 767-300BCF, or Boeing Converted Freighter. Three companies now offer passenger-to-freighter conversions of the 767-300: Boeing, IAI, and Wagner Aeronautical. The 767-400ER is the final extended variant and was first offered for sale by Boeing in January 1997. It was first ordered in March 1997 by Delta Air Lines to replace its remaining Lockheed L-1011s. Continental Airlines followed in June 1997 with a -400ER order to replace its DC-10 fleet. The new 767 variant was developed after Boeing ended work on the proposed 777-100X. Other airlines also placed orders, but these were eventually canceled or converted to other Boeing models. The 767-400ER is a major development over the 767-300. The -400ER was stretched 21.1 ft (6.43 m) from the -300 for a total length of 201.4 ft (61.4 m). It also featured a new glass cockpit, redesigned wings with a wingspan increase of 14.3 ft (4.36 m) over the previous two variants, larger passenger windows from the 777, new Boeing Signature passenger cabin and redesigned landing gear. The -400ER is the only 767 variant to also feature raked wingtips for increased fuel efficiency. This variant is only available as the 767-400ER, as there was no 767-400 variant. The 767-400ER has less range than the other two ER variants; a longer-range version, the 767-400ERX, was offered for sale in 2000 but canceled in 2001. The 767-400ER's first flight was on October 9, 1999, and entered into service with Continental Airlines on September 14, 2000. The 767-400ER received FAA approval for 180-minute ETOPS before entering service. Its closest competitor from Airbus is the A330-200. The 767-400ER is expected to be replaced in Boeing's line-up by the 787-9. A total of 38 Boeing 767-400ERs have been delivered, with 16 to Continental Airlines and 21 to Delta Air Lines, the 767's largest customer. Airlines were operating 37 of this variant as of July 2010. Airborne Surveillance Testbed - the Airborne Optical Adjunct (AOA) was built in 1987 from the prototype 767-200, and later renamed the Airborne Surveillance Testbed (AST). Modifications to the aircraft included a large "cupola" or hump which ran along the top of the aircraft from above the cockpit to just behind the trailing edge of the wings. Inside the cupola was a suite of infrared seekers that were used to track theater ballistic missile launches in a series of tests. After test flights the aircraft was stored at the Victorville Airport in California in 2003, and ultimately deregistered in 2007 before scrapping. E-767 - AWACS platform used by the Japan Self-Defense Forces; it is essentially the E-3 Sentry mission package on a 767-200ER platform. Japan operates four E-767s. The first E-767s were delivered in 1998. KC-767 - initially developed from the -200ER for the USAF's KC-X tanker competition, an effort to replace some of its oldest KC-135E tankers, the KC-767 was selected in 2003 and later designated KC-767A. However the Pentagon suspended the contract due to a conflict of interest scandal and canceled it in 2006. Boeing subsequently offered the KC-767 Advanced Tanker, which was based on the pending 767-200LRF (Long Range Freighter). KC-767 Tanker Transport - a 767-200ER-based aerial refueling platform has been ordered by the Italian Aeronautica Militare, and the Japan Self-Defense Forces. The JASDF has received all four KC-767Js ordered. The Aeronautica Militare received the first of its four KC-767As in January 2011. Boeing offered a longer range version of the 767-400ER, named 767-400ERX for sale in 2000. It was introduced along with the Boeing 747X and was to be powered by 747X engines (Engine Alliance GP7172 and Rolls Royce Trent 600). The -400ERX offered an increased maximum takeoff weight of 465,000 lb (211,000 kg) and range of 6,150 nmi (11,400 km). Kenya Airways provisionally ordered three -400ERXs to supplement their 767 fleet. However, in 2001 Boeing canceled -400ERX development. Kenya Airways converted their order to the 777-200ER. The E-10 MC2A was to be a 767-400ER-based replacement for the USAF's Boeing 707-based E-3 Sentry AWACS, E-8 Joint STARS, and RC-135 SIGINT aircraft. This included an all-new system, with a powerful Active Electronically Scanned Array and was not based on the Japanese E-767 AWACS aircraft. One 767-400ER aircraft was produced as a testbed for systems integration. But the program was canceled and the prototype was sold to Bahrain as a VIP transport in January 2009. 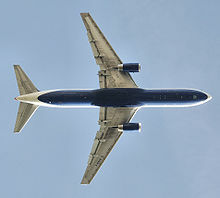 As of July 2010, 863 Boeing 767 aircraft were in airline service with 55 on order. Airline operators included Delta Air Lines (101), American Airlines (73), All Nippon Airways (60), Japan Airlines (49), ABX Air (38), Air Canada (47), UPS Airlines (37), United Airlines (35), and others with fewer aircraft. Data through end of December 2010. Updated on January 17, 2011. As of January 2011, the 767 has been in 41 incidents, including 11 hull-loss accidents, resulting in 569 total fatalities. The type's first fatal crash, Lauda Air Flight 004, occurred on May 26, 1991 following the in-flight deployment of the left engine thrust reverser on a 767-300ER; none of the 223 aboard survived, and as a result of this accident all 767 engine thrust reversers were deactivated until a redesign was implemented. On October 31, 1999, EgyptAir Flight 990, a 767-300ER, crashed off Nantucket Island, Massachusetts in international waters killing all 217 people on board; the probable cause was determined by the NTSB to be flying of aircraft into the water by the first officer, but Egypt disputed this conclusion. On April 15, 2002, Air China Flight 129, a 767-200ER, from Beijing to Busan, South Korea, crashed into a hill while trying to land at Gimhae International Airport, during inclement weather. The crash resulted in the death of 129 of the 166 people on board, and the cause was attributed to pilot error. The 767 has been in six hijackings involving 282 fatalities. On November 23, 1996, Ethiopian Airlines Flight 961, a 767-200ER, was hijacked and crash-landed in the Indian Ocean near Comoros after running out of fuel, killing 125; the 50 survivors were a rarity among instances of large land-based aircraft landing on water. Two 767s were involved in the September 11, 2001 attacks on the World Trade Center, resulting in the collapse of its two main towers. American Airlines Flight 11, a 767-200ER, crashed into the north tower, killing all 92 people on board, and United Airlines Flight 175, a 767-200, crashed into the south tower, with the death of all 65 on board. In addition, over 2,600 people perished in the towers or on the ground. Two notable 767 incidents were survived by all on board. On July 23, 1983, Air Canada Flight 143, a 767-200, ran out of fuel in-flight and had to glide with both engines out almost 50 miles (80 km) to an emergency landing. The pilots used the aircraft's ram air turbine to power the hydraulic systems for aerodynamic control. There were no fatalities and only minor injuries. This aircraft was nicknamed "Gimli Glider" for the airport at which it landed. The aircraft, registered C-GAUN, continued service within Air Canada until its retirement in January 2008. On December 22, 2001, Richard C. Reid tried to shoe-bomb American Airlines Flight 63, a 767-300ER flight from Paris to Miami. Passengers and crew prevented him from lighting the fuse and subdued him. He was arrested, and later convicted and imprisoned. As a result airline passengers departing from U.S. airports are required to remove their shoes for scanning at security checkpoints. As new 767s roll off the assembly line, older models have been retired and scrapped. Some aging 767 models, exceeding 20 years in age, were kept in service in the 2010s past planned retirement dates following delays of replacement aircraft such as the 787. One aircraft is known to have been retained for exhibition, specifically the first 767-200 to operate for Delta Air Lines, N102DA. The display aircraft, named "The Spirit of Delta" by the employees who helped purchase it in 1982, underwent restoration at the Delta Air Lines Air Transport Heritage Museum in Atlanta, Georgia. Featuring the original delivered interior as well as historical displays, the aircraft is viewable by Delta employees and the general public by appointment. Becher, Thomas (1999). Boeing 757 and 767. Crowood Press. ISBN 1-86126-197-7. Birtles, Philip (1999). Modern Civil Aircraft: 6, Boeing 757/767/777 third edition. Ian Allen Publishing. ISBN 0-7110-2665-3. Donald, David (Ed.) (1997). The Complete Encyclopedia of World Aircraft. Barnes & Nobel Books. ISBN 0-7607-0592-5. Eden, Paul (editor) (2008). Civil Aircraft Today: The World's Most Successful Commercial Aircraft. Amber Books Ltd. ISBN 1-8450-9324-0. Haenggi, Michael (2003). 767 Transatlantic Titan. "Boeing Widebodies" series. Motorbooks International. ISBN 0-7603-0842-X. Kane, Robert M. (2003). Air Transportation 1903-2003. Fourteenth Edition. Dubuque, Iowa: Kendall/Hunt Pub.. ISBN 978-0-7872-8881-5. Norris, Guy; Wagner, Mark (1999). 767: Stretching and Growing "Modern Boeing Jetliners". Zenith Imprint. ISBN 0-7603-0717-2. Norris, Guy; Wagner, Mark (2001). Boeing 777, The Technological Marvel. Zenith Press. ISBN 0-7603-0890-X. Shaw, Robbie (1999). Boeing 757 & 767, Medium Twins. Osprey Publishing. ISBN 1-85532-903-4. Smil, Vaclav (1998). Transforming the Twentieth Century: Technical Innovations and Their Consequences. Oxford University Press. ISBN 0-1951-6875-5. Sutter, Joe (2006). 747: Creating the World's First Jumbo Jet and Other Adventures from a Life in Aviation. Washington, DC: Smithsonian Books. ISBN 0-06-088241-9. Wells, Alexander T; Rodrigues, Clarence C (2004). Commercial Aviation Safety.. McGraw-Hill Professional. ISBN 0071417427. Wilson, Stewart (2002). Ansett: The Story of the Rise and Fall of Ansett, 1936-2002. Aerospace Publications. ISBN 9-7818-7567157-1.